James Clark’s Christmas Dinners for stranded students were legendary. He was the youngest “old man” on the campus. The genuine friendships he forged with students and faculty were to him an elixir of perennial youth. For the alumni, he was among the most cherished memories of their college years. His kindness, humor, patience, and counsel, were invaluable, as was his courage to take on a staggering array of vital responsibilities. For more than two decades, James Benjamin Clark was the indispensable guardian angel of the University. Born in North Carolina, raised in Mississippi, and an 1885 graduate of Harvard University (photo at right), Clark settled in Bonham, Texas in 1873 with his wife, Florence, and opened a successful law practice. 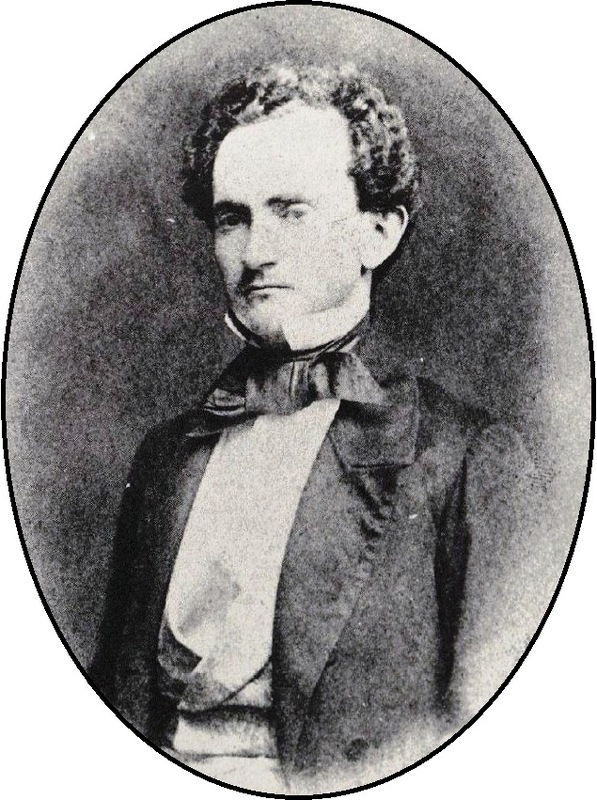 A decade later, Governor John Ireland asked Clark to serve on the Board of Regents for the soon-to-be-opened University of Texas. He accepted, but didn’t remain a regent for long. Ready to move again, and excited at the prospect of being involved with the initial development of a university, Clark offered to take on the duties of proctor. His fellow regents agreed. 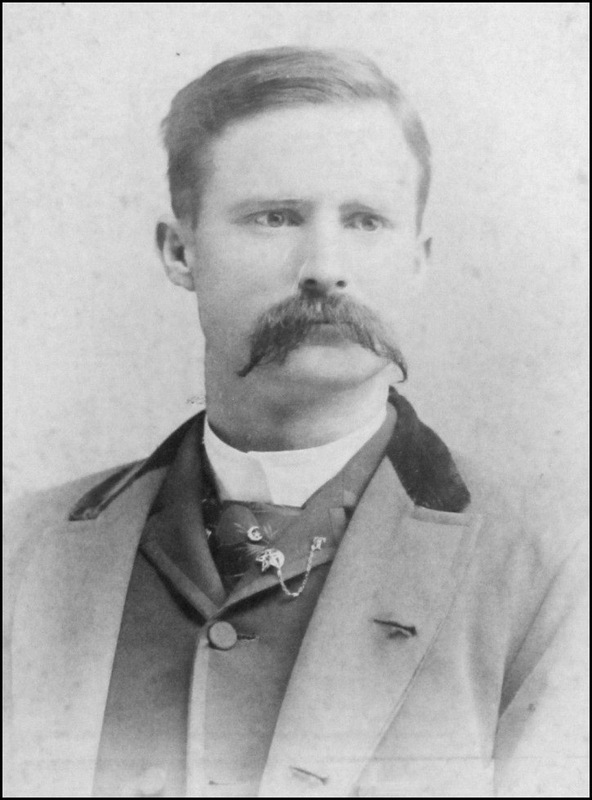 In July 1885, Clark resigned as a regent, moved his family to Austin, and at 50-years old took up the only non-teaching position on the Forty Acres. 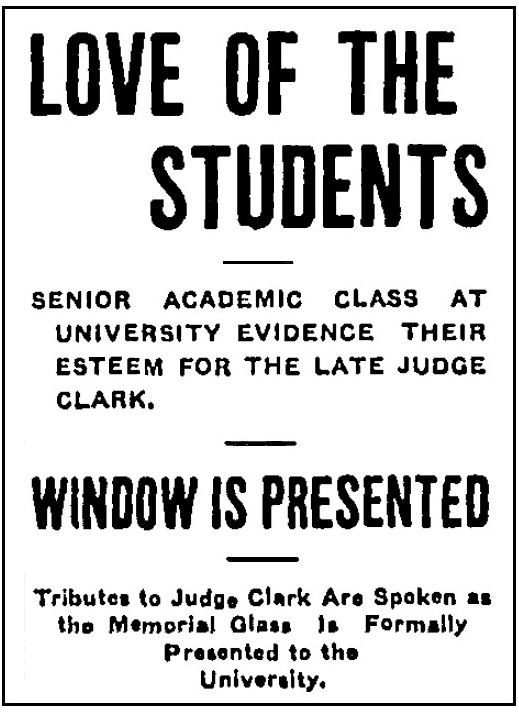 Faculty, too, occasionally fell into trouble and needed Clark’s help. 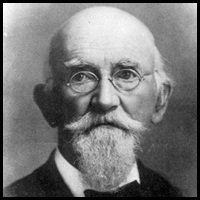 One of them was the rusty-haired Thomas Taylor (photo at left), hired in September, 1888 to teach applied mathematics as well as courses in mechanical drawing. His classroom in the old Main Building was on the third floor, directly above the library, and was outfitted with drafting tables, chairs, and a faucet and sink for cleaning the drawing equipment after class. Austin’s water works, though, weren’t always reliable in the 1880s, and the water pressure was often insufficient to make it to the third floor. 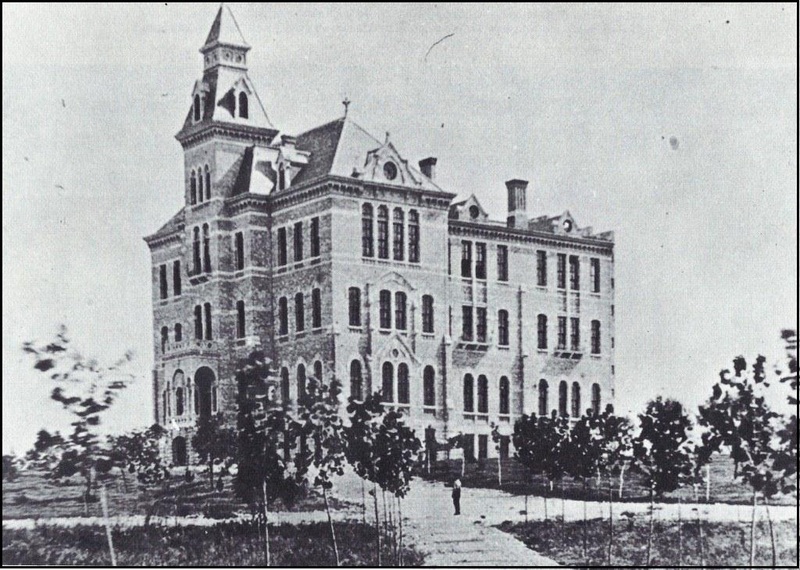 On the afternoon of May 2, 1889, near the end of Taylor’s first academic year on the campus, he turned on his classroom faucet, but no water was forthcoming. Since this had happened many times before, Taylor simply went downstairs in search of a place to scrub his equipment. This time, though, he forgot to turn off the faucet before he left. Overnight, with most of the city’s residents asleep, the water pressure returned to normal levels, and the faucet began to run. Since the basin had been plugged, the water filled the sink, overflowed, and began to flood the room. By the next morning, much of the third floor was a large puddle, and water had seeped downstairs to the University library, where many of the books were ruined. Taylor was more than a little upset, and was certain his short career at the University was over. But Clark reassured the young professor, quietly had the water damage repaired, and replaced some of the library books at his own expense. In a report to the Board of Regents, Clark minimized the harm done as “not so great as might be expected,” and took some of the blame himself for not checking the building more thoroughly that evening. The regents were reassured that steps had been taken so that a similar incident wouldn’t happen again. In part because of Clark’s intervention, Taylor remained at UT for more than 50 years, founded and developed its engineering program, became the first Dean of Engineering, and was one of the most loved and respected professors on the campus. 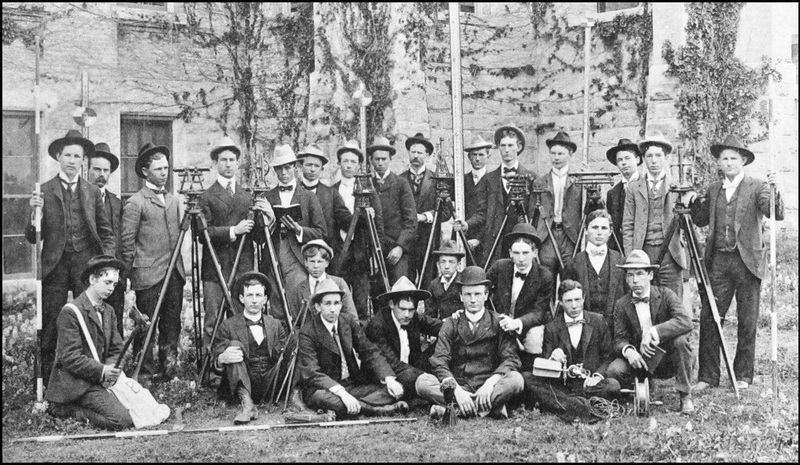 Above: A 1904 engineering survey class. Professor and Dean of Engineering Thomas Taylor is back row center, with the mustache. Along with his duties to faculty and students, Clark had to look after the grounds. When the University opened in 1883, the square, 40-acre campus was inhabited by the west wing of the old Main Building, a set of temporary outhouses down the hill to the east, and little else. 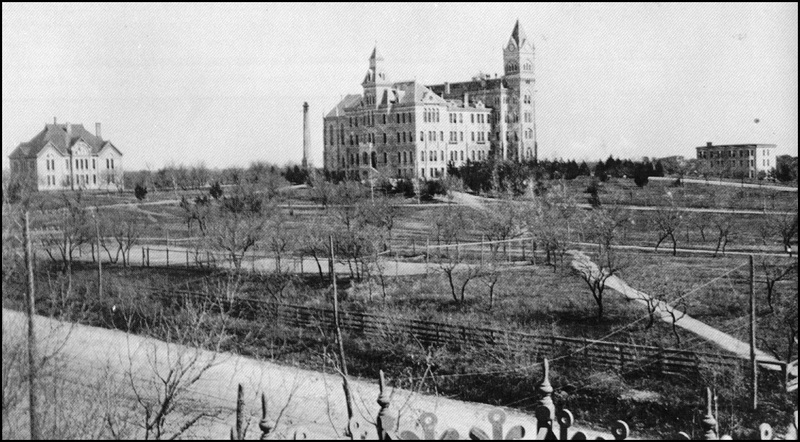 Near the close of the Civil War in 1865, most of the trees on the future campus had been hastily razed and used to build Confederate defenses for Austin. By April 1882, as the regents considered plans for a University building, the grounds were cleared of remaining tree stumps, and a mile-long, white-washed wooden plank fence was erected around the perimeter of the campus, with gaps at the corners and at the south and west entrances. 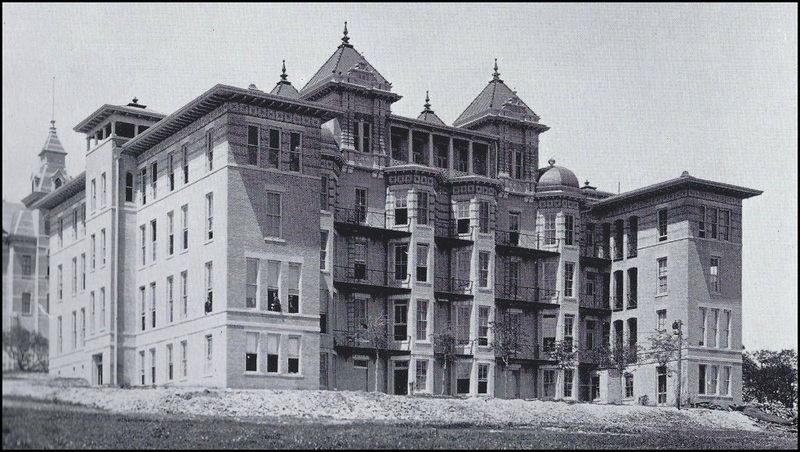 Above left: The west wing of the old Main Building in the 1880s. The planted trees and graveled pathways were added by James Clark. Clark re-sodded the areas damaged by the construction of the west wing, laid out graveled walks, and planted live oak, mesquite, and cedar trees. At his home he grew English walnut and pecan trees from seeds, and when the saplings were tall enough, Clark transplanted them to the Forty Acres. Florence assisted by planting flower beds around Old Main. The greening of the campus, though, brought unwanted visitors. Austin’s family-owned cows, which wandered freely about the town, found the grounds a favorite place to graze, and made a special effort to eat the tender leaves of the newly-planted trees. While Clark denounced the cows as the “most ruthless of raiders,” their appetites were also a distraction to classes. Harried professors had to regularly interrupt their lectures en masse to herd noisy cattle away from classroom windows. To stem the bovine invasion, Clark filled in the gaps of the perimeter fence with turnstiles and gates. Surprisingly, the turnstiles weren’t very popular with the students. “They are nuisances to the stranger who is out late on a dark night, to the young ladies whose dresses are easily torn, to the tardy student whose overcoat pocket “hangs him up,” and to our regiment of absent-minded poets who commune with the stars during their evening strolls.” Besides, the cows had somehow learned how to operate the turnstiles themselves. Gates replaced the turnstiles, but were almost always left open. By 1895, the gates had been removed entirely, and the fence had fallen into disrepair, but the town cows had since found other places to graze and weren’t a concern. 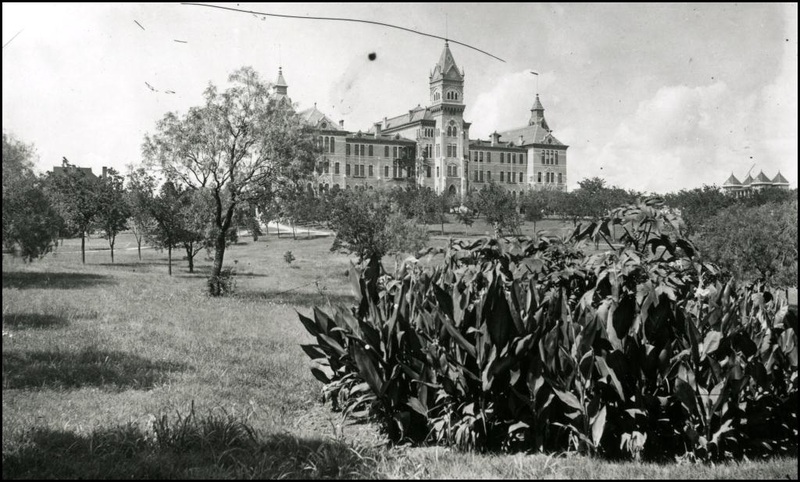 Above: The Forty Acres from the southwest in 1895. The old wooden fence can still be seen along an unpaved Guadalupe Street. 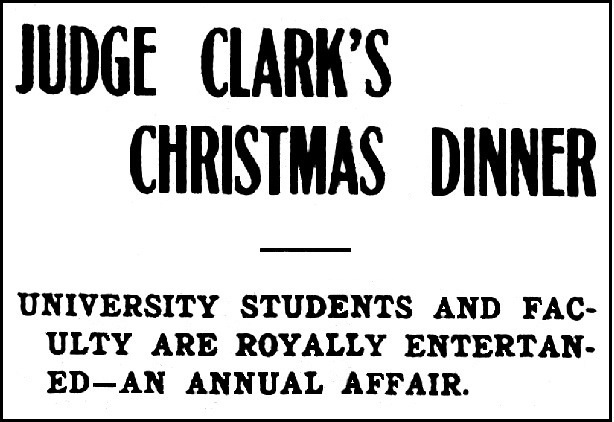 Among his many contributions to the University, Clark was perhaps best known for his Christmas Dinners. For almost a decade after the University opened, only Christmas Day was allowed as a holiday. Students repeatedly complained, argued there wasn’t enough time to travel home and return to campus before classes resumed, and petitioned the faculty for a week-long holiday. In 1891, the faculty at last acquiesced. Most of the students fled the campus for home, but there were still a few, all of them residents of B. Hall – the men’s dorm – who didn’t have the funds for a train ticket. Above: B. Hall as seen from Speedway Street. The dining room was on the ground floor in the central part of the building. While the University president sometimes attended and offered to share the cost, Clark was adamant on providing for the dinner himself. 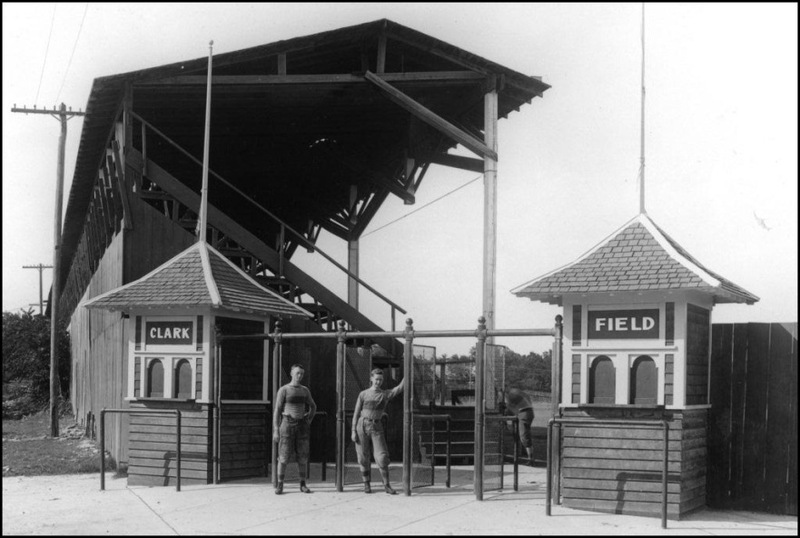 Above: The entrance to Clark Field, UT’s first athletic field, named for Clark in 1906. 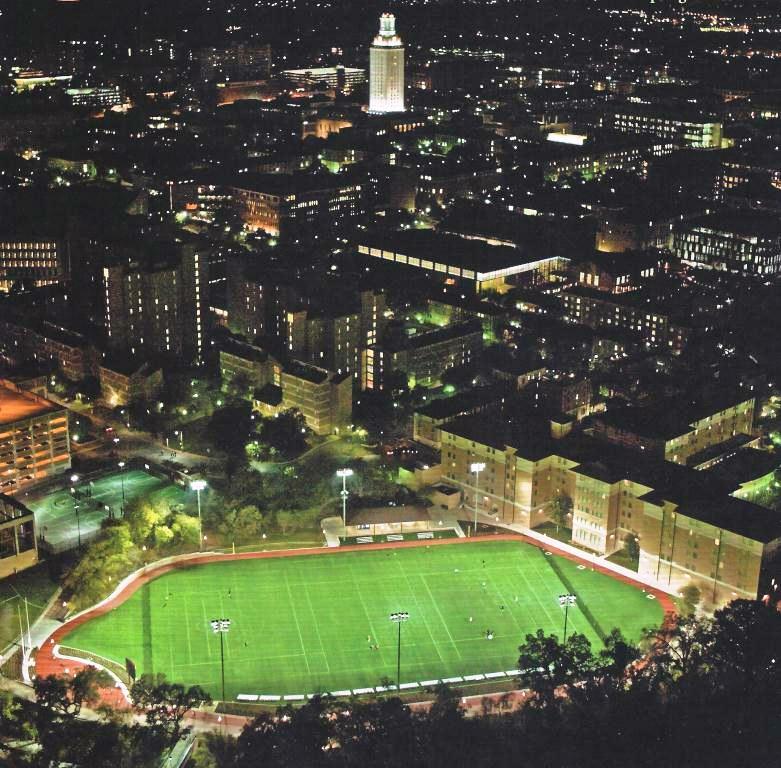 The field in question was a lot just east of the Forty Acres, about where the O’Donnell Building and the Gates-Dell Computer Science Complex are today. The University purchased the land in 1899 to use as an athletic field. Frank’s idea to name the field after Clark quickly found traction on the campus. Letters from fellow students appeared, and Frank began to refer to the grounds as “Clark Field” in print. His successor continued the effort. By the fall of 1906, the Athletic Council approved the name, and the Board of Regents quickly made it official. Above: The present day Caven Lacrosse and Sports Center at Clark Field is managed by the Division of Recreational Sports. Through the years, Clark Field has wandered about the campus. When the original athletic field was closed in the 1920s in favor of the present DKR-Texas Memorial Stadium, the name Clark was assigned to a new baseball facility where the Bass Concert Hall now stands. Baseball moved to its present location in 1975, and the old “Freshman Field” along San Jacinto Boulevard was renamed for Clark and placed under the management of the Division of Recreational Sports. On December 6, 1908, James and Florence Clark arrived at the auditorium of the old Main Building to hear a speech by William Jennings Bryan, the three-time presidential nominee. Clark smiled and waved to his many friends, and the couple took their usual seats on the front row. Just minutes before the start of the program, Clark’s head dropped, and his shoulders slumped forward. Florence knew immediately that something was wrong. Clark was hurried to his office while a doctor was summoned, but it was too late. At the conclusion of Bryan’s speech, Bryan himself learned, and then announced, that the University’s beloved proctor of twenty-three years had passed away. Two days later, an enormous crowd that included UT President Sidney Mezes, the Board of Regents, the entire faculty and student body, and many alumni and friends in Austin, gathered at the Clark residence. With a horse-drawn cart to carry Clark’s coffin in front, the assemblage formed double lines and quietly followed for more than two miles to Austin’s Oakwood Cemetery, where Clark was interred. 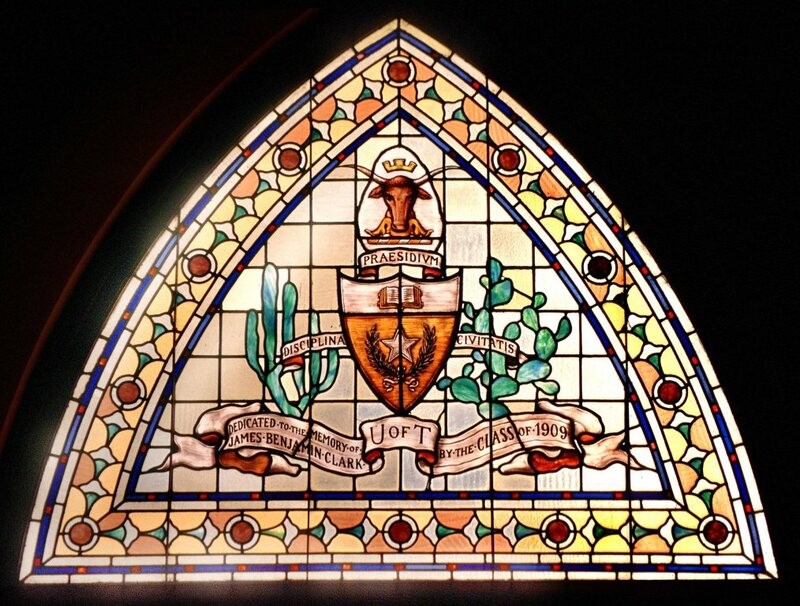 Above: The senior class of 1909 donated a stained glass window in memory of James Clark. It was initially installed in a place of honor, above the south entrance of the old Main Building. In the 1930s, when Old Main was razed and replaced by the current Main Building and Tower, the window was preserved and can be seen just inside the Office of the Dean of Graduate Studies on the first floor.